One voice, who is indeed a music legend is Fela Anikulapo- Kuti. 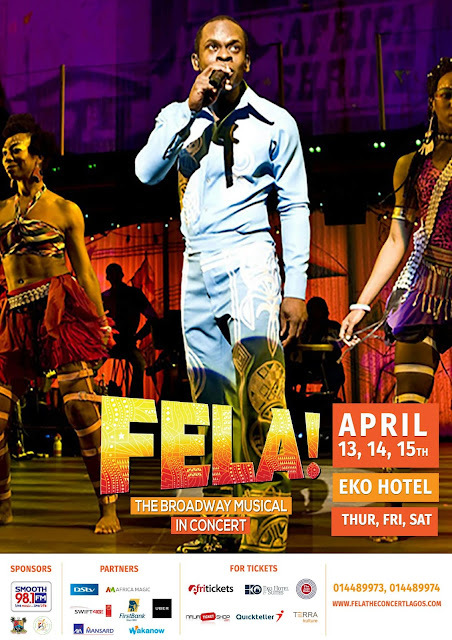 In a chaotic world burdened with non-stop reformation, Fela's music was borne of humanity and an overriding quest to influence the tide of the tempests tormenting civilization. His melodies has over the years experienced persistent rebirth in several forms. The pioneering father of Afrobeat,is as influential as the story of his extraordinary life. Starring cast members of the Tony Awardwinning Broadway musical, the shows promises Afro-beat music lovers and enthusiasts from all over the world unforgettable nights of dance and music by the late Afro-beat maestro. Tickets are available on: Felatheconcertlagos.com, Quickteller, The Naija Ticket Shop and AfriTicket, SMOOTH FM Studios, Terra Kulture, Jazz Hole - Ikoyi & Ikeja and Eko Hotel Lobby.